Children’s play generally begins with a home or family theme as that is what is familiar to them. As their world and experiences expand, so does their play. When children pretend to be someone (or something) different, they are in control and get to decide the outcome of the situation they are acting out. Role playing helps them to understand what is going on in their world, and they develop skills that help them to deal with what is happening in their lives now, and going forward. During roleplay, children learn to cooperate and collaborate with their peers. They negotiate and problem solve as they act out different roles and situations. Children use their imaginations with props, and are amazingly clever with their creativity in coming up with solutions and using items in their role playing. While acting out various roles and situations, children are practicing both fine and gross motor skills. They develop and expand their language skills in acting out situations and before and during roleplay to convey their ideas, motivation and reasoning to their peers. We can extend language skills development by incorporating print into the dramatic area. By including money, calendars, menus, phones, cash registers, etc. in the dramatic area we can promote understanding of basic math concepts. OArt is expression. Through art, children are able to express their joy, fear, anger, curiosity or sadness. Art can also be a powerful form of therapy. Art is about the senses – all 7 of them. Sometimes art will simply flow from a child, with no conscious plan, idea or outcome. 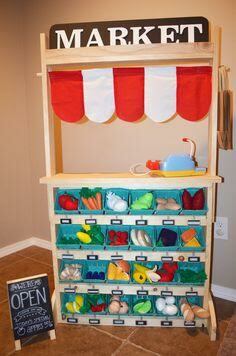 But other times, children are using thinking skills, taking a concept and choosing materials, colours, etc. to create what they envision. Art can be science. When children mix colours they are learning cause and effect. They experiment with textures, colours, lines and materials. They are learning how materials react with each other, and when they discover what methods or mediums work together and which don’t, they are problem solving. 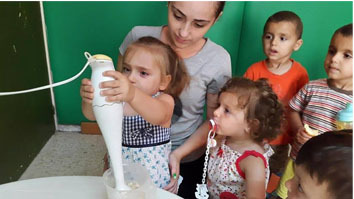 When children are introduced to art and its mediums, techniques and even theory and history, they also learn the language of art. Art gives children opportunities to express themselves, not just through the art itself, but as they talk about what they have created. Drawing, painting, cutting, gluing, tearing, lacing, kneading… Art is fine motor development. We all know children love to play with blocks. There’s so much you can do with them! Most of us just can’t resist building with them. In fact, if you put a pile of alphabet blocks in front of an adult, chances are he or she is going to start building something or spelling something out in block letters. They’re irresistible. But are children learning anything when they play with blocks? Blocks provide the materials for children to create structures and designs limited only by their own imaginations. Often, the block area becomes the dramatic area as children act out scene or stories using props or playing the actors themselves. When children play with blocks, they are working on problem solving and early math concepts. As they play, explore and experiment with blocks, children learn about the qualities of the materials. They are learning about size, shape, weight, texture, and colour. As their play progresses, and children begin to build with blocks, they begin to learn about length, height, volume and physical space. Children build strength in their hands when they pick up blocks and stack or fit them together. Stacking and fitting blocks together develops fine motor skills and eye-hand coordination. 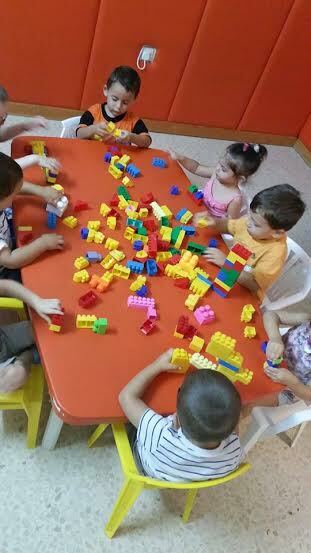 Finally, Children learn to cooperate and work together when they play with blocks. Children also learn to respect or value their own structures, and those of other children. WCooking can do a lot more than teach young kids about food preparation. It can help build their vocabulary, introduce math skills and much more. Basic math skills, from simple counting to fractions, can be introduced in the kitchen. As you add ingredients to the bowl or pan, ask your little one to count along with you. Introduce the concept of fractions with the use of measuring cups and spoons. Pre-schoolers can understand the definition of "half" even it's too early for them to learn much more. When you cook with your kids, use a recipe. Read it out loud together, introducing your child to new words and terms along the way. Pre-schoolers, even if they can't read at all yet, this will help introduce letters, promote literacy and build the child's vocabulary. As kids get older, they can continue to reap the benefits of cooking. For example, cooking foreign cuisine can introduce them to different cultures. Throughout our lives we learn about new things and make memories through exploring with our different senses. While in the kitchen, talk to your kids about how the foods and ingredients look, feel, smell and taste. For picky eaters, if they have helped in the preparation of food, and like the look and the smell, they'll be more willing to give new foods and dishes a try. While grocery shopping, invite kids to seek out unique fruits and veggies that they haven't tried before and then incorporate their food choices into your meal planning. As pre-schoolers begin to explore their independence, they love the opportunity to accomplish things on their own (or with a little of their parents' help). Making food -- from tossing a salad to assembling tacos to baking cookies -- will help boost their confidence as they feel a sense of accomplishment. When preparing, cooking and serving food, praise your child's efforts every step of the way -- no matter what their creations look or taste like. Incorporating music into the daily routine at our nurseries, children provide far more positive development than a simple appreciation of music. Teachers and parents are aware that an early exposure to music increases math and language skills, but many aren’t aware that music structured throughout a pre-schooler’s day also provides considerable social, emotional, and physical benefits. With just a little creativity and a willingness to have fun, music can enhance your children’s learning environment. Music can strengthen a child’s mind. Music seems to involve the brain at almost every level. When young children are routinely exposed to music, they will increase their verbal, emotional, and spatial intelligence in addition to improving body movement and coordination. 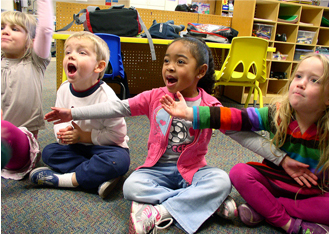 Musical literacy at preschool level should be defined by nothing more complicated than the ability to sing in tune and carry a beat. The ability to play instruments and understand music theory, which comes later in life, is actually an added benefit of early exposure to music. A little bit of song goes a long way in the development of young minds and bodies. Reading aloud and sharing stories with children is one of the most important and enjoyable things you can do together. Sharing stories, talking and singing every day helps your child’s development. Therefore that is why it is very important to read with children. 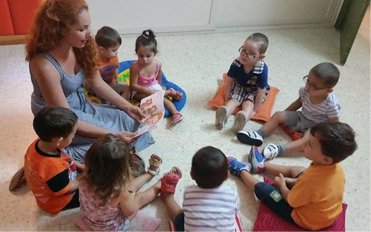 You will be getting the children familiar with sounds, words, language and, eventually, the value and joy of books. This all builds each child’s early literacy skills and helps the child go on to read successfully later in life. Reading stories stimulates the child’s imagination and helps the child learn about the world around. It’s also a great time for you to bond with the children and share time together. Water is one of the basic raw materials for purposeful play. Just like sand, clay, and blocks, children can use water without being constrained by the one, right way to use it. Unlike many of the commercially produced, flashy playthings tempting us between Saturday-morning cartoons, water is a plaything that fosters curiosity, imagination, and experimentation, and it is free. In the early childhood setting or outdoors, a water centre can be the catalyst for building concepts, developing language, and promoting social skills. 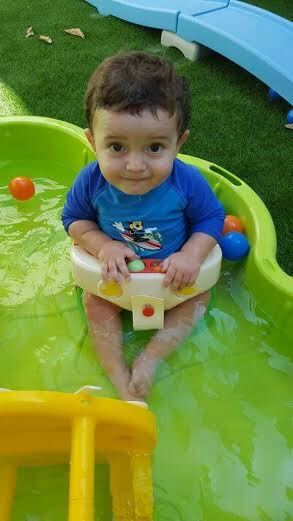 Water play is developmentally appropriate regardless of the child’s physical condition, age, language, gender, culture, or exceptionality. Water is intriguing. It seems to draw children to explore its structure and properties. Because water is naturally fascinating, the thoughtful teacher can structure the environment and materials in the water centre to make the most of water play. What can children learn from water play? Thoughtfully prepared, whether indoors or out, can foster cognitive development, teach mathematics and science concepts, enhance physical skills, promote social learning and cooperative effort, and enrich language experiences. 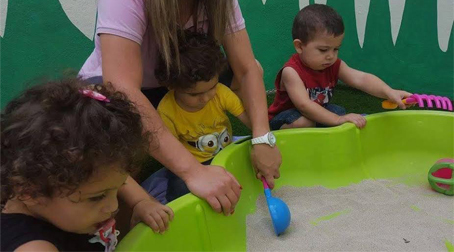 Sandplay invites participation; it permits children to make and test hypotheses; it stretches the imagination; it provides a potentially soothing sensory experience; and it is an excellent avenue for children to learn physical, cognitive, and social skills. According to constructivist theory (Piaget, 1945), children have an inner drive to build an understanding of their world as they explore and interact with materials. Concepts about how the world works are built gradually and become increasingly complex as the child enters a rich learning environment and exercises his or her freedom to play. All of our staff are professionally trained.